The affordability of natural stone tile has prompted many construction companies and interior remodeling contractors to utilize this material in both the kitchen and bath areas. Natural stone tiles create a unique and elegant indoor atmosphere that is breathtaking to behold. Marble, granite, travertine, and engineered stone are all used for home interiors, and the characteristics of each determine how the total design is achieved. Stonexchange is a direct importer of fine quality natural stone tiles, kitchen backsplash pieces, window sills, and thresholds. We are a bulk distributor of marble, granite, travertine, and paver stones. Our clients include home improvement centers, flooring retailers, and specialty tile installers. During the design phase of a kitchen and bathroom, special attention needs to be given to what type of floor and wall material will be used in order to highlight and accent the room. Natural stone is one of the most popular choices for floors and shower stalls, kitchen tiles and countertops. We stock the most commonly requested tile shades and can even provide our clients with non-standard sizes if the building instructions call for custom styles. Because of its availability and long-lasting quality, stone has been used in construction since the days of ancient Greece. Even in those times, granite and marble were known to be extremely valuable as interior construction materials because of their beautiful appearance. However, transporting heavy stone was expensive and time-consuming, meaning that only the wealthiest of citizens could afford such opulence. Today, natural stone tiles are shipped from quarries to all points of the globe. Manufacturers of stone flooring products often partner with a local distributor in order to transport huge amounts of marble, granite, or travertine across the ocean via container ship. 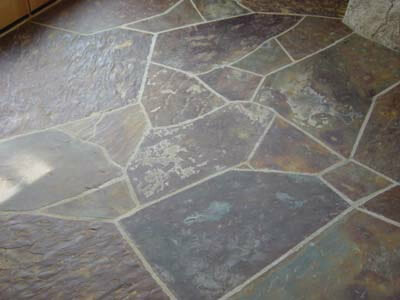 Our company stocks all of the popularly used stone tile materials used for kitchen and bathroom floors. We have studied the construction industry in detail and have made note of which styles and color shades are most often requested by homeowners and business property developers. We offer our beautiful marble, granite, travertine, and engineered stone tiles at wholesale prices because we import these materials in large quantities. The darker shades of granite are often used when a surface of tiles covers a kitchen floor or countertop. China Black and Black Galaxy are two of the popularly named shades often called for in building instructions. This material is extremely hard, has tiny spots or striations, and can be polished or honed according to the desires of the client. Polished black granite has a wonderful shine that does not fade over time. The hardness of the material makes it quite resistant to scuffing or chipping. Granite is easily cut into tiles using a diamond dust-tipped saw blade. Our Absolute Black Granite is expertly cut and polished at a specialty manufacturing plant located overseas. The tiles are shaped into squares, corners, and side pieces that can contain bevels or bull noses. Black granite floor tiles complement lighter shades of cabinetry very nicely. Stained or varnished wood cabinetry is accented to the fullest when the floor is covered in granite tiles. This product is virtually maintenance-free and does not require constant waxing or cleaning. Marble has always been prized by homeowners as an elegant flooring tile material. The lighter crema shades have wonderful swirl patterns created when the stone was contaminated with other minerals during the compression process. These tiles can be configured in such a manner that results in a truly custom look to the kitchen or bathroom floor. Crema marfil shades are a cream and beige tone that are perfect for use as a flooring tile. The medium shade complements darker accents such as walls, shelving, or cabinetry. This stone is favored by those who wish to achieve a natural look to the interior environment. Building plans often call for the use of Botticcino or Bursa Beige marble. Our Crema Marfil Sahara is the stone of choice when this look is desired. One of the great advantages of using a cream shade of marble is that it blends perfectly with other neutral shades used in the kitchen or bath. It looks quite beautiful when complementing shades include chrome or silver used as towel racks or shower rods. Crema marble is also perfect for a kitchen floor. The neutral color works as a light accent to the darker wood used in some cabinetry, and the beige sets off and highlights darker tiles used as backsplash material above the countertop. Our Nuevo White Carrara marble is perfect for use when building plans call for Alabama or Georgia White, Cherokee, or Carbonia. This lighter shade is often used for flooring tiles in commercial buildings, but homeowners are discovering just how easily it transforms a kitchen or bath into a stately-looking environment. Nuevo White marble is commonly used as a floor tile in the bath area. Its lighter shade streaked with gray complements silver, steel, chrome, or aluminum very well. It also acts as a lighter accent material when darker cabinetry is installed. The shade is also popular for use as a water barrier saddle or threshold in and around the bathroom. Window sills made from Nuevo White Carrara are becoming increasingly popular, and Stonexchange stocks a huge assortment of sills and thresholds that perfectly match the floor tiles made from this natural stone. Nuevo White marble also works extremely well in bath areas where a large amount of reflecting glass is used. Mirrors create a sense of depth in a bath area because of the visual effect of doubling the room volume. When a lighter shade of marble is used as a flooring surface, the entire bath area becomes brighter because of the visual effect created by the mirrors. Nuevo White Carrara marble is also the stone of choice when a jewel-toned bathroom decoration is desired. Blue and green accents such as shower curtains and mosaic tiles look quite lovely when paired with a lighter shade of marble floor tiles. It is also easy to match the shade of Nuevo White Carrara to any lighter color of marble used for a soap caddy or for the bathroom sink. Pure white stone tiles are dazzling in their appearance. However, this type of marble is quite rare and usually contains unwanted contaminants that ruin its overall look. Engineered stone may be the answer for any contractor wanting to satisfy a client’s insistence on a snow-white flooring tile. Our Pure White Thazoz is manufactured using glass and resin. It is a bright white, is extremely hard, and is as durable as our natural stone products. It is also non-absorbent and will not fade in color over years or even decades. White tiles are preferred when the complementing shades are at least as dark as a medium tan. Cabinetry, kitchen furniture such as wood or metal tables and chairs, and medium-to-dark countertops and backsplashes stand out very nicely when the floor is covered in bright white tile material. One of the great challenges of interior design is to complement the primary shade of stone tiles to accents made from similar materials. At Stonexchange, we offer our commercial clients a vast array of travertine products, marble mosaics, and marble thresholds. We also carry a full line of window sills manufactured from the same material as our popular floor tiles. Retailers and commercial floor installation firms will be happy to know that bulk ordering of our tiles not only saves a great deal of money, it ensures that the different types of materials needed will be closely matched in color shade. This is especially important for those clients requiring a large order for a residential development project. Our company guarantees that the material delivered will allow for many different placement patterns and a close match of shades between floor tiles and other products such as thresholds and window sills. Our travertine is not popular as a flooring tile, but it perfectly complements the granite and marble floor tiles we carry. Travertine is often used as part of a kitchen backsplash design or as a wall accent in the bath area. At Stonexchange, top-quality stone flooring material at wholesale prices is what sets us apart from smaller import operations. We partner directly with quarrying operations and overseas cutting specialists, and we import our material in bulk quantities. Our full-crate delivery system means great savings on the most popular styles of flooring tiles. Because we sell only to commercial clients, we offer excellent savings on freight costs as well. Contractors and home improvement centers can rest assured that their inventory is always full of the desired product. Construction companies needing a good variety of tile products for use as showcase flooring in model units will be happy to know that the exact shade and style of natural stone tile is always on hand. Be sure to look over our product pages for detailed information on sizes and colors of our popular window sill and threshold materials. Feel free to contact us with questions about ordering, delivery schedules, and non-standard sizes of tiles or other products. We look forward to becoming your direct importer and distributor of the world’s finest natural stone tiles.